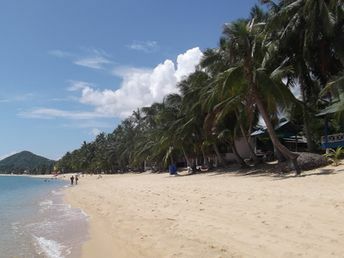 This beach ranks #4 of the "Best beaches in the World"
Directly on the beach there are inexpensive bungalows. Usually they are very basic, and it is not always possible to book in advance. It is also possible to find a cozy cottage with a kitchen and a (common) pool from 900 baht per night, - or from 450 baht per night when renting for a month. Fly to Samui Airport (USM). Then hire a taxi (for 500 bahts). See more details on how to get to Samui island - here. Any time of the year except October and November, as this period is featured by the maximum amount of rain. Attention! A good part of the beach is in the west side. Do not choose a hotel in the eastern part of the beach, despite the best deals. There is a huge number of cafes in the beach area. Lunch will cost from 150 bahts (Tom Yam soup - from 100 bahts). We recommend a good cafe in the western part of the beach near the Temple (near Lamprayah pier). Usually more cheaper the cafe - then it's more tasty. There's also nearby - on the ring road - a cafe called "We are number 1", with unlimited meals for 160 bahts (drinks are for extra money), - very tasty! Usually it's crowdy there.